Whether you plan to display a Post index (a summary list of your blog posts) on the home page of your site or not. Whether you plan to use WordPress-generated index and archive summary pages or regular Pages with Page Builder Post modules. Note: These options are only concerned with whether you use WordPress-generated index page or one of the SqueezeFunnels Posts modules to display a summary of your Posts. The choice is not affected by whether you plan to use Page Builder layouts in your blog posts. Use this procedure when you plan to put your blog on your home page and have WordPress generate the Posts index on that page. In other words, your home page will have no physical Page; WordPress will generate it when the home page loads. Tip: Don't use this procedure if you plan to use any of the SqueezeFunnels Posts modules on your home page. Go to Customize > Settings > Static front page. This setting instructs WordPress to generate your Posts index as your home page. Use this procedure when you plan to locate your blog on some other page of your site besides the home page and let WordPress generate the index for the blog posts. In the example in the following screenshot, you'd use this procedure to create the Blog page linked from this menu item, assuming that WordPress would generate the Posts index on that page. This procedure has two tasks: creating the page and then configuring WordPress to know you want your blog to start on that page. This empty page will serve as the place where WordPress generates the Posts index. 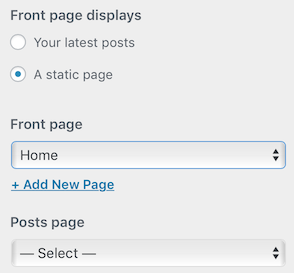 From the WordPress admin panel, go to Pages > Add New. Create a title for your Posts archive page and click Publish. If you want your new page to appear in your menu and it isn't added automatically, add it manually at Customize > Menus. Go to Appearance > Customize > Settings > Static front page. In the Post page box, select the page you just created. This setting instructs WordPress to generate a Posts index on that page. You don't plan to create Posts or a Posts summary. You plan to use one of the SqueezeFunnels Posts modules to display a summary of your Posts on any page on your site, rather than a WordPress-generated index page. This procedure applies whether or not the Posts module appears on your home page or elsewhere. For Front page, elect the name of your home page. For Posts page, don't select anything.